It’s quite normal for toddlers to show bad behaviours every now and then, merely because they’re developing and experiencing all sorts of new feelings that they might not know how to handle or express in a right way. And bad behaviour, such as: tantrums, hitting, biting, screaming, lying and other, can be replaced with a better one, but here’s how. For parents to handle a bad toddler behaviour, they should first of all understand their little one’s motives and reasons behind that bad behaviour. Afterwards, they can start the discipline process, which should always include implementing better behaviour. Aggressive behaviour is a very normal part of toddlers’ development. And it’s all because of the emerging language skills, their desire to become independent, and the lack of impulse control. Aggressive behaviour, especially when it gets physical (hitting, biting, pulling hair) is completely unacceptable, and should be dealt with the sooner the better. How to handle it: being aggressive yourself in handling your toddler’s bad behaviour won’t get them to change their behaviour. And if anything, it might just give them more ways of being aggressive. Avoid yelling, hitting, or telling your toddler he’s bad. And instead show him you can control your temper. Respond immediately by removing your toddler from the situation, give him some time-out, and then reinforce the better behaviour. Your toddler needs to know that words are much stronger than physical action, and therefore that’s what they need to use when asking for something. Parents need to know that toddlers interrupt others for many reasons, the most important one is because they still think the world revolves around them, and everything and everyone in it work for only their benefit. And thus, what they’ve got to say is more important. Also, a toddler’s short term memory is not fully developed yet, and therefore, they impulse to say things before they forget. And because interrupting has a physiological basis, it makes no sense to a toddler, because he can’t grasp that other people has got other activities or things to do. How to handle it: your toddler isn’t purposefully trying to drive you insane by interrupting you, and they will eventually understand the meaning of interrupting. But for now, all you can do is minimize the times in which your toddler can interrupt you, like meeting your friend in a place with a kids play area to keep them busy. You can also schedule your phone calls to when your toddler is asleep. While reinforcing the better behaviour can be done by reading books on the matter, and setting an example yourself. Toddler below the age of 4 can’t yet tell the difference between reality and fantasy, which means they can’t grasp the concept of lying. And the reasons toddlers fib for are: imagination, forgetting things, the angel syndrome (in which a toddler recognizes his parents think he can’t do anything wrong, and he believes it himself) and to draw attention. How to handle it: because your little ones’ tall tales are harmless and a part of his development, all you can do is relax instead of getting mad. And encourage truth-telling by thanking your child every time they tell the truth. Also, don’t accuse your child or overburden them, and instead build trust with them. Temper tantrums happen on a sudden, they’re fierce and unpredictable. One minute you’re enjoying dinner with your toddler, and the next whining and screaming at the top of their lungs because the straw is not blue. 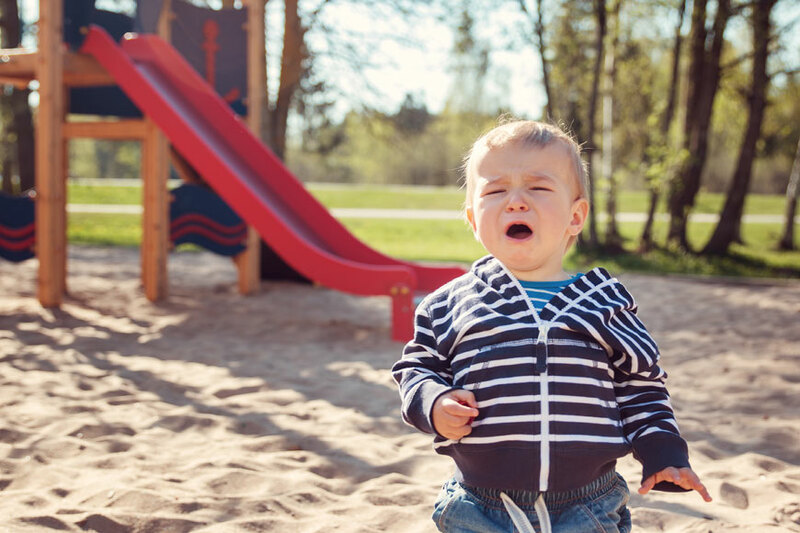 Toddler ages 1-3 are especially prone to tantrums, and that’s their way of expressing frustration. How to handle it: first of all, you need to keep calm, and if you find yourself getting frustrated, simply leave the room. Don’t give in to any unreasonable demands no matter how long a tantrum is. And remember you’re the adult, and you’re in control. Use time-outs and talk about the tantrum afterwards when both of you and your toddler are calm. Remember to let your child know you love him, and for next times, try to head off tantrum-inducing situations, and watch for signs of stress. Toddlers whine when they feel powerless and try to draw their parents’ attention. Children at young ages rely on their parents, and especially mums, for almost everything. And when they don’t get what they need right away, they start pitching their requests in higher and higher tones. Because they know no other way of expression yet. And it’s very important for parents to teach toddlers how to ask and express themselves in acceptable manners, because the more results they get from whining, the more likely they are to perceive it as an effective way. How to handle it: make sure your toddler knows what whining is, and realize how awful it sounds. Also, point out that you can hear your toddler better when they’re using their regular voice. And never respond to their demands while whining. Try not to ignore your child’s needs for too long, and always try to respond immediately when they ask nicely. Show them better ways to address their problems and needs, and avoid triggers like hunger and tiredness.